Carol Hitchcock is an Australian singer and actor. She had a top 20 hit on the Kent Music Report Singles Chart with her cover version of "Get Ready" in mid-1987. It also peaked in the top 60 in the United Kingdom and top 50 in New Zealand. In 1985 Hitchcock had acted in the TV series, Prisoner. At the age of 14 Carol Hitchcock cut her hair short "a crew-cut. Then I dyed it a million, thousand colours and did anything and everything you could do to your hair. Then I shaved it off. Actually, that was for a modelling job. Being hair less is comfortable. It's no big deal." In August 1987 she reflected, "I would not have called myself a career model; it'd been more a case of having work offered to me." She was also a part-time bouncer for various Melbourne nightclubs, the Club and Inflation. In the 1980s she acted in TV programs, including an appearance in Prisoner in 1985. Hitchcock began her music career as a vocalist for Melbourne-based funk band, Bang. Six months later she transferred to another funk group, Cat People. She signed with Mushroom Records in Australia in the mid-1980s. At that time her appearance included a bald head, nose ring and ear piercings. Early in 1987 she was flown to London by Mushroom, where she recorded a cover version of the Temptations' 1969 track, "Get Ready", with United Kingdom producers, Stock Aitken Waterman. The trio had recommended the track for her and she felt that "they were so wonderful to work with." Michael Wellham of The Canberra Times observed that "Get Ready" was a "Giant dance floor stomper to sing along with, that threatens dire things if you don't get your disco act together. Your little heart will be danced away to a pop tune as polished as the head that sings it. Just what every party needs." She also recorded a cover version of "More Than Words Can Say", a Stock, Aitken, Waterman composition, for its B-side; originally by Mel and Kim on their album, FLM (April 1987). "Get Ready" peaked at No. 18 in Australia, No. 56 in the UK, and No. 47 in New Zealand. Hitchcock was also part of the backing chorus on a charity record by Ferry Aid, to raise funds for the Zebrugge Ferry Disaster, which covered the Beatles' song "Let It Be" (March 1987). The recording featured Paul McCartney, Kate Bush and Bananarama. The final episode of Countdown aired on 19 July; the compère, Molly Meldrum, interviewed Hitchcock. Her music video for "Get Ready" was also broadcast. In August of that year Hitchcock anticipated working on her second single with Stock, Aitken, Waterman, "I'll just wait to see what happens after this next single. They seem to like me, they've said I'm easy to get along with, and there is talk about an album." In March 1988 Wellham contrasted Hitchcock's music video for her single with Kylie Minogue's "I Should Be So Lucky" (December 1987) – both are produced by the UK trio – and found "one of their relatively memorable singles was [Hitchcock]'s 'Get Ready'. Her gimmick for that single was her shaven head. The reason that single was memorable was the threatening tone of [her] vocal. On this single, all Kylie has to offer is sweetness. Bad for the teeth, as it grates." According to Australian musicologist, Ian McFarlane, "The gutsy singer had made her mark but, unfortunately, there was no follow-up and Hitchcock slipped from view." During the mid-1980s Hitchcock was married to fellow Australian singer, Roger Hart (ex-Little Heroes). ^ "Number One article on Carol Hitchcock, 13 June 1987 (page 42)". shanemaris.net. Retrieved 18 July 2017. ^ a b c d e f g h i Coelli, Andree; Wellham, Michael (13 August 1987). "Good Times: Ska's not the Limit". The Canberra Times. 61 (18, 941). p. 29. Retrieved 23 February 2017 – via National Library of Australia. ^ a b c McFarlane, Ian (1999). "Encyclopedia entry for 'Carol Hitchcock'". Encyclopedia of Australian Rock and Pop. St Leonards, NSW: Allen & Unwin. ISBN 1-86508-072-1. Archived from the original on 15 June 2004. ^ Kent, David (1993). Australian Chart Book 1970–1992 (Illustrated ed.). St. Ives, N.S.W. : Australian Chart Book. p. 139. ISBN 0-646-11917-6. N.B. 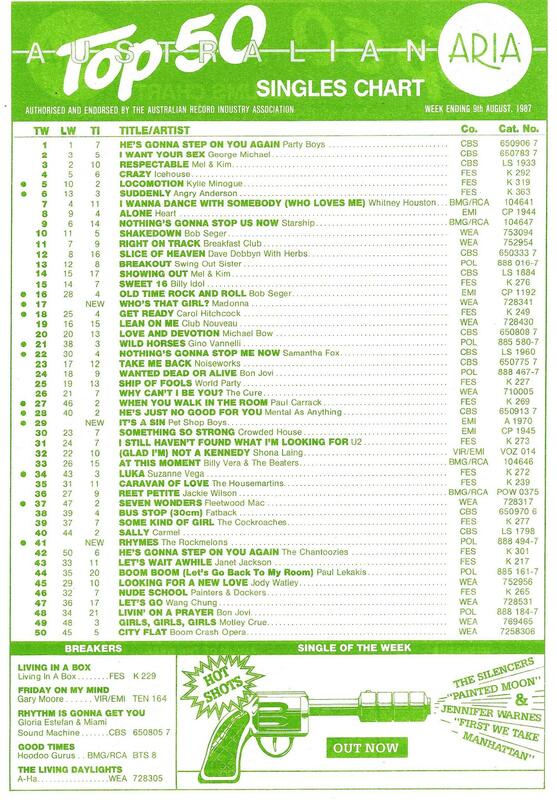 The Kent Report chart was licensed by ARIA between mid-1983 and 19 June 1988. ^ "Australian Top 50 ARIA Singles Chart – Week Ending 9th August, 1987". Imgur.com (original document published by ARIA). Retrieved 18 July 2017. ^ "Official Charts > Carol Hitchcock". The Official UK Charts Company. Retrieved 24 November 2015. ^ Hung, Steffen. "Carol Hitchcock – 'Get Ready' (Song)". Hung Medien. Archived from the original on 28 January 2016. Retrieved 24 November 2015. ^ a b Liddle, Steven. "Lyn Paul website: New Seekers - Collectors' Items (flexi discs, vinyl and cassettes)". www.lynpaulwebsite.org. London, UK: The Lyn Paul Website. Retrieved 10 November 2011. ^ "Rage Re-Runs (The History of Countdown Repeats on Rage". Countdown Memories. p. 2. Archived from the original on 13 August 2010. Retrieved 24 February 2017. ^ a b "Welcome to the Countdown Archives: Episode 563". Baseportal. Retrieved 24 February 2017. ^ Wellham, Michael (17 March 1988). "Good Times: Rock Video". The Canberra Times. 62 (19, 156). p. 43. Retrieved 23 February 2017 – via National Library of Australia.